We frequently get calls from people requesting an estimate to “top” their trees. “My tree was planted too close to the house.” “The tree has grown too tall and creates too much shade for my grass to grow.” We have heard it all. No matter what your reason for considering topping a tree, we will absolutely NOT top your tree (and neither should you)! First, when you top a tree you are essentially mutilating it. Cutting off large limbs indiscriminately leaves your tree looking disfigured and ugly. Second, you are left with a tree that is now in distress — it has little to no leaves to nourish itself, protect itself from the sun, and it has open wounds that leave it vulnerable to attacks by pests & disease and decay. Third, your distressed tree goes into survival mode and starts to grow multiple sprouts/shoots. These turn into weak little branches that will have to be A) pruned more often and B) will break off more easily (translation: it becomes more messy). Did we mention how ugly they are? Finally, if any company tells you that topping is the best option for your trees (no matter what the reasoning they give), turn around and run. While some “tree guys” still think it is an acceptable practice, they are wrong and clearly not educating themselves on the 25+ years of literature explaining its harmful effects. Sadly, sometimes trees outgrow their space and the best option is to remove them and replace them. For more information about properly maintaining your trees, please visit: Trees Are Good – Pruning Your Trees or consult a local arborist to help you figure out the best approach for your trees! When this tree was planted in East Nashville, all those electrical and service lines might not have existed. But now, especially since the tree has been mutilated beyond repair, the best option here would be to remove the tree and replace it with a tree more appropriately sized for its location and proximity to wires. 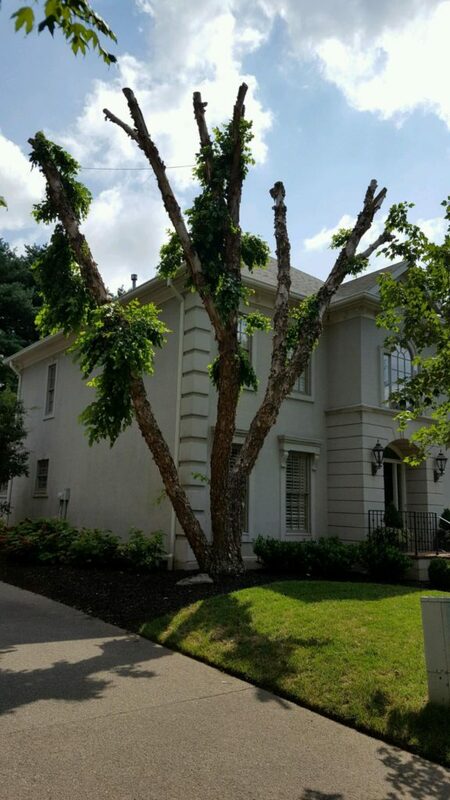 Two major limbs are completely dead, and the tree will require topping year-after-year (costing you more money) to maintain distance from the wires. It is also suffering a slow, painful death, so please consider not just your bank account, but also the tree’s quality of life before you top! Better yet, DON’T DO IT! River Birches were a popular landscape choice in the 80s & 90s because of their fast growth. However, this Belle Meade tree was topped to reduce shade to the grass and to get the canopy away from the roof. The tree should have been removed in the first place, because it is too close to the foundation and will eventually cause issues. 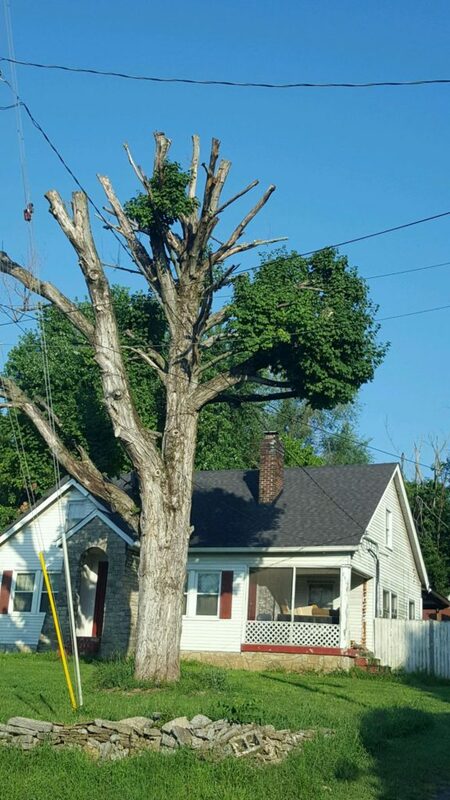 It not only looks terrible now, it will actually cost the homeowner more money as removal is a necessity — the weakened stems from topping are now at a greater risk of falling. 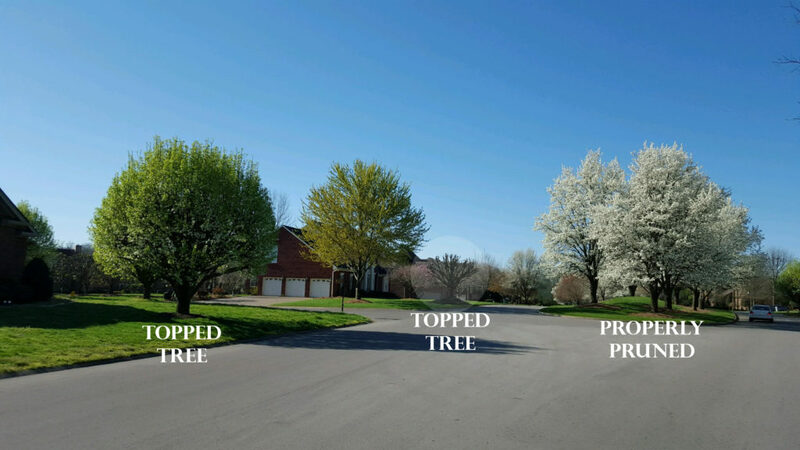 You can see how topping has affected the trees in this Old Hickory neighborhood. The more you top a tree, the more money you will spend and they will continue to look worse each year. Tree on Left: this topped tree leafed out with an unnatural shape and did not flower (notice the shoots going straight up). Tree in Middle: this topped tree is clearly dead — its stubby trunk is unsightly and reduces your property value. Trees on Right: these properly pruned trees have a beautiful, natural shape & flowered nicely!